Understanding the function of butter in baking can be incredibly useful in becoming a better baker! Butter is a key ingredient in many baked goods. Having a grasp on the science of butter’s various roles in baking is beneficial in using butter more successfully to create beautiful pastries and baked goods. The question of, “What is butter?” may seem like a silly one. But if we are going to get really in depth about the function of butter in baking we should really understand the basics of what butter is! Butter is the solid fat product that results from churning cream. The process of churning cream separates out the solid butterfats (the butter) from the liquid (the buttermilk). If you’ve ever made whipped cream and accidentally whipped it too long, you are well on your way to making fresh homemade butter! The majority of butter that is seen in the grocery store is made from cows milk. However, butter can also be made from other animals such as goats, sheep, or buffalo. All butter in the US must be pasteurized. This means that it is churned from cream that has been heated to kill bacteria. The label of “sweet cream butter” indicates that the butter was made with pasteurized cream. Butters vary a bit in their fat content. All butter must contain at least 80% fat, though some do contain more. 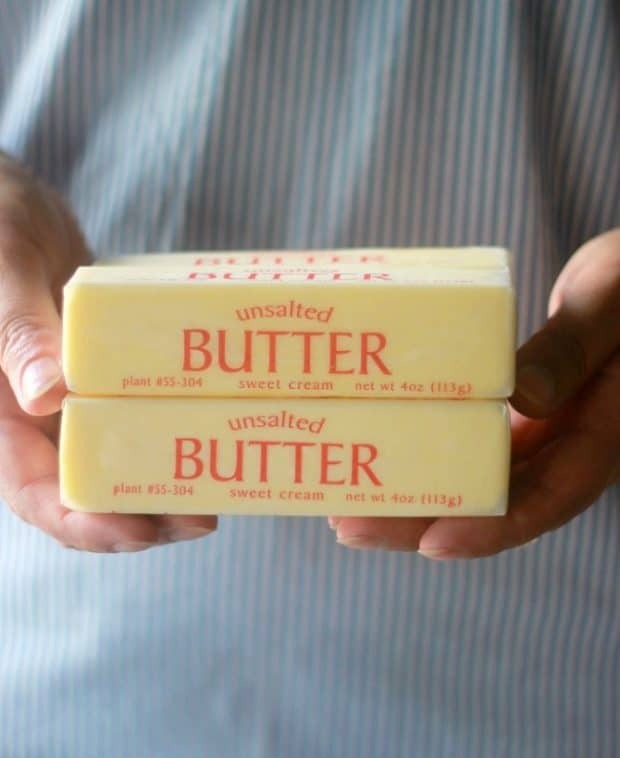 Most generic butter brands in the US stay at the 80% fat mark. However, many Euorpean style butters are around 82-84% fat. Perhaps the most obvious role butter plays in baking is adding flavor to baked goods. The flavor butter adds to pastries, cakes, cookies, and more just really can’t be mimicked. There are products that are “butter flavored” such as butter flavored shortening, but the richness that comes from real butter is distinct. Butter, and all fat in general, create baked goods that are more tender. I think the best example of how this works is to think about the texture of a baguette and to compare that texture to brioche bread. Baguette falls into the category of “lean bread” because the dough does not contain any fat. Breads without fat are crusty on the outside and very chewy on the inside. This is because there is no fat present to inhibit the formation of gluten strands. In contrast, breads that contain fat in their dough, like brioche, have a softer and more tender texture. Butter, and all fats that are solid at room temperature, fall under the umbrella baking term of “shortening.” Ever wonder how that solid vegetable fat got its name? This term comes from the way in which fat serves to shorten gluten strands. Without getting too in depth into the science of it, when fat coats flour, it serves to slow down the process of gluten formation creating a more tender product. Laminated dough: Butter is folded into the dough over and over again to create layers which rises the dough when it bakes. In baking, when you think about how to make something rise, butter is not the first thing that comes to mind. But butter can actually play an important roll in leavening many baked goods. Puff pastry is a perfect example of this. Puff pastry gets its incredible rise solely from the butter that is layered throughout the dough. Butter is not pure fat, it does also contain some water. For this reason, when cold solid butter hits a hot oven, the water starts to evaporate and the steam gets trapped in the dough and causes it to rise. Cold cubed butter, room temperature “softened butter, melted butter. 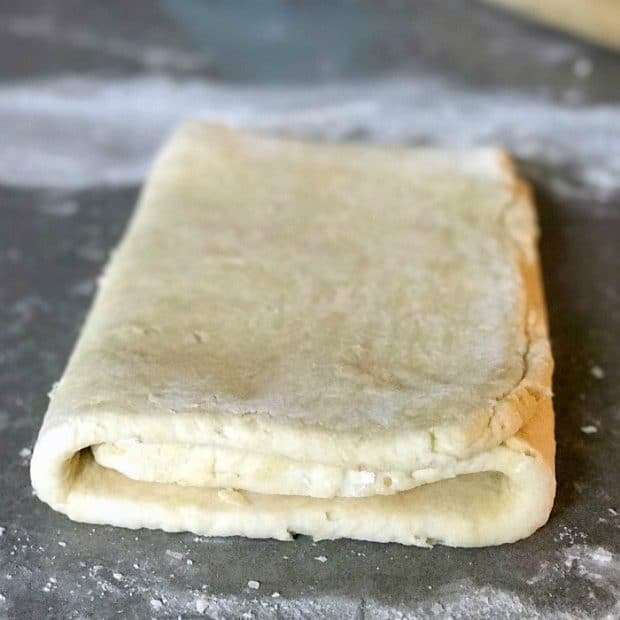 In general, butter should be cold for any kind of flaky pastry such as: Biscuits, Pie Crusts, Puff Pastry, Scones, etc… The flakiness of these pastries rely’s on the butter staying somewhat separated from the rest of the dough. 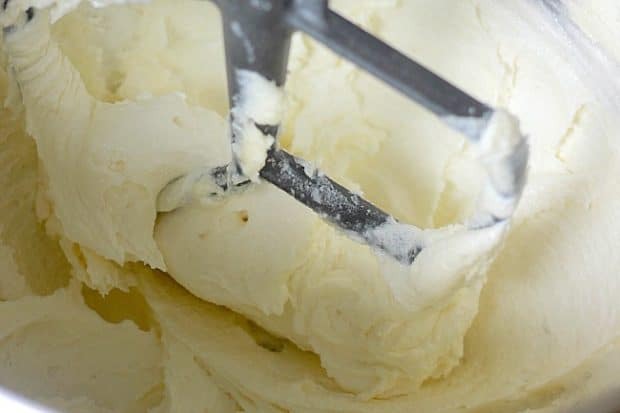 If you’ve ever made biscuits then you know that the fat is cut into the butter until it is like coarse meal, but it isn’t completely mixed into the flour until it becomes one solid mass. This all goes back to the role of butter as leavening in baking. The water in those little pieces of butter will start to evaporate in the oven creating little tiny pocks of steam all over the biscuit which creates the flakiness. In general, butter should be softened when it is going to be creamed with sugar. The ideal temperature for butter that will be creamed is 68-70F. Many times, since most kitchens are hotter than 70F, butter is allowed to become too warm before the creaming process. Remember, butter is completely liquid at 90-95F, so even at 80F it is starting to get too soft. Softened butter in baking is creamed together with sugar to aerate it before the rest of the ingredients are added. The process of beating the butter and sugar together creates this whole network of fat, sugar, and air. This helps to leaven your baked good and creates a more fluffy and tender product. There is no hard and fast rule for when you should use melted butter in baking. Some non-traditional recipes use it for various reasons. For example: the vast majority of chocolate chip cookie recipes call for softened butter to be creamed with sugar as the first step. However, Alton Brown’s famous chewy cookie recipe calls for melted butter to be used in combination with a higher protein bread flour. The water from the liquid butter will combine with the bread flour to create more gluten structure, hence a chewier cookie, than if it were creamed with the sugar. Melted butter is also called for in many types of quick bread recipes, such as pancakes, muffins, waffles, or quick loaf breads. Traditionally, these recipes usually call for a liquid fat like vegetable or canola oil. The liquid fat creates a more dense texture to the final baked good. Melted butter can be substituted in a recipe calling for liquid fat when you want to keep a similar texture but want to add the butter flavor. You will typically see two main kinds of butter in the dairy section of the grocery store: Salted Butter and Unsalted Butter. The main difference between these two is obvious- one has salt added and the other does not. However, its important to understand when you might want to use one over the other. In general, most bakers prefer to use unsalted butter. This way they can control the amount of salt going into their baked goods. Unsalted butter is typically more fresh as well because salt is a preservative and salted butter has a longer shelf life. This is another reason bakers often prefer unsalted butter over salted butter. I typically reserve salted butter for uses of spreading on toast or with sauteing vegetables. If you only have salted butter on hand when making a baking recipe that calls for unsalted butter, you can adjust the salt in the recipe. 1 stick (4 oz) of salted butter has a little over 1/4 tsp of salt in it. You can use this guideline to decide how much salt from the recipe to omit. Brown butter, also known as beurre noisette, is simply butter that has been has been heated up so that the milk solids start to brown and the water evaporates off. Compared to traditional butter, brown butter has a very different taste. The flavor is very nutty and toasted. Brown butter can be used in baked goods in place of regular butter to change the flavor profile and create more depth. You should keep in mind the temperature the original recipe calls for in regard to the butter. For instance, if the recipe calls for softened butter, the brown butter needs to be brought back up to room temperature and a solid state before using it in your recipe. 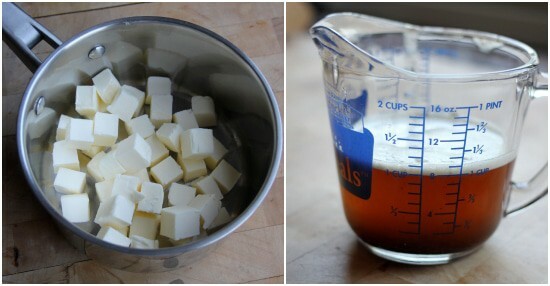 You should also note that brown butter loses about 2 TBSP water per stick (4 oz) when browned. You will need to replace this moisture in your recipe by either adding more milk, a little water, or if the recipe calls for another liquid you can increase that amount. As stated earlier, most generic butters have about an 80% fat content while many European style butters or “high end” butters contain a higher percentage of fat. For this reason, many bakers who create pastries that are very dependent on butter such as croissants, feel very strongly about using European style butter because it creates a richer pastry. In general, I stick with the cheap stuff for everyday use. But if you want to get serious about creating really over the top pastries it is something to consider as a factor. If I can be real for a moment, there is no true substitute for butter in butter. There just really isn’t anything that will completely replace butter both in taste and in the texture butter creates in your baking. However, there are a few things you can use if you absolutely cannot use butter or do not have butter on hand. Note: When substituting butter in baking you need to keep in mind if the original recipe is calling for melted or solid butter. This will help you determine which substitutions will work. Lard, or pork fat, is one of my favorite fats to use in baking other than baking. Leaf lard is the highest grade pork fat. It is snow white and has a very mild taste which makes it great for baking. It creates really tender baked goods and my all-time favorite biscuits are made with leaf lard. 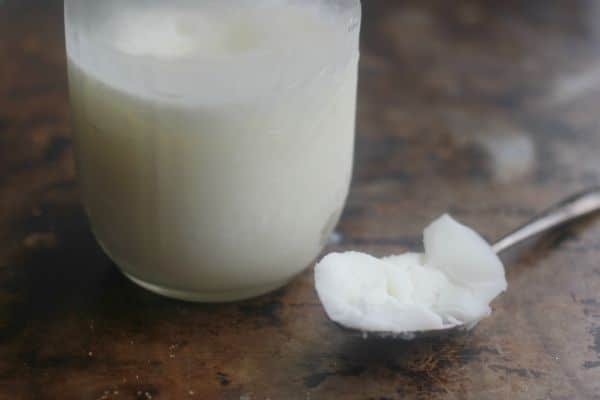 I would recommend finding a good quality leaf lard, like this one from Fatworks, and not the hydrogenated cheap stuff you often see in the grocery store. If you’re really ambitious, you could render your own lard! Tip: If you want to add a smokey flavor to whatever you are baking you could also consider using bacon fat! If you grew up in the 80’s and 90’s like me, chances are you usually had margarine around. To be completely honest, I had no idea that the big tub of margarine in our refrigerator was any different from real butter. When I first started teaching myself to bake over 10 years ago, I would always unknowingly use margarine in place of butter. I guess the point of this story is that you can use it successfully in many baked goods. The important thing to note about margarine is that its fat content is much lower than in butter. Butter is at least 80% fat and margarine is sometimes as low as 35%. This means that it has a higher water content and can produce tougher baked goods. I definitely would not recommend using margarine in a recipe that has a very high ratio of butter in it such as a laminated dough. Vegetable shortening, like Crisco, is pure fat containing no water within it. For this reason, it tends to create baked goods that are more soft than pastries prepared with butter. A chocolate chip cookie prepared with only vegetable shortening will typically have a very soft texture without any crispness to the outside. Some people prefer this texture, but be aware that the flavor profile will be different. Vegetable shortening also has a higher melting point than butter, which means that baked goods hold their shape a little better with shortening vs butter. A pie crust made with shortening will not shrink quite as much as a pie crust made with butter. But a key thing you will notice about baked goods made with vegetable shortening, is that they leave a fatty mouth feel that lingers. With a melting point of about 116F, this makes sense that it does not melt in your mouth, so to speak. 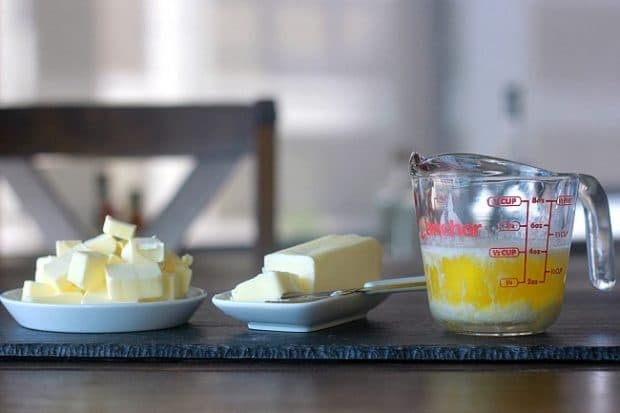 When using more non-traditional, or healthier, substitutes for butter in baking you should consider how key butter’s function is in the baked good you are making. Baked goods that have a little more room for error, such as cookies, muffins, or dense cakes, lend themselves well to using these substitutions. Recipes that are more delicate and that require more precision, such as tender cakes, rich breads, and laminated doughs do not do well with these more non-traditional substitutions. Applesauce, mashed banana, mashed avocado, and greek yogurt can work as butter substitutes in some baked goods. 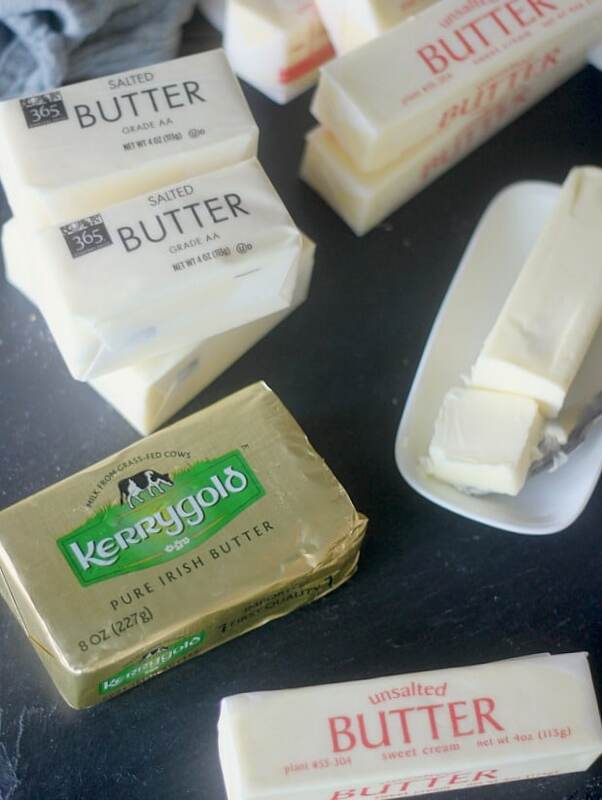 I recommend starting with replacing just half of the butter with one of these substitutions to start with. If it is successful, then you could try to replace a higher percentage of the butter on the next try. Because baking involves science and a lot of different factors, there is no hard and fast rule for what will work as a substitution for butter in all baked goods. You may need to go through some trial and error to figure out what works best for you. When substituting brown butter for regular butter in a recipe do you measure it after the browning process? Also, do you have to replace the evaporated liquid? Hey Jeffrey! Isn’t brown butter the best in baked goods? I love it so much! So if your recipe calls for 4oz butter, start with 4 oz butter, brown it, and add 2 Tbsp additional liquid to your recipe. My apologies, I read thru the article and totally missed that section!!! Thank you very much for the clarification! No apologies needed! It’s a great question! Je suis d’accord! Il n’y a rien de mieux que le beurre dans les pâtisseries!